Garrus Darelliun is the second-in-command of the Cheydinhal City Watch. He has no love for Captain Ulrich Leland and with your help, he will take Ulrich down one way or another. Garrus is one of few named NPCs who will respawn if killed. Garrus wields a silver longsword in combat. He wears chainmail boots, chainmail greaves, and chainmail gauntlets. 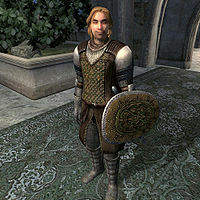 He wears a Cheydinhal cuirass and carries a Cheydinhal shield, clearly revealing his identity as a Cheydinhal Guard. When off duty he wears leveled lower class pants, shirt, and shoes. He carries keys to the Castles interior and exterior along with a key to his quarters in the Guards barracks. Besides that he carries a bread loaf and a small amount of gold. He sleeps in the castle barracks from midnight to 6am, then spends an hour in the Castle Great Hall before spending 15 solid hours patrolling the area around the throne. He heads back to the barracks at 10pm for an evening meal, then it's bedtime once more. The exceptions to this schedule occur during the related quest. At stage 95, if the player has found the necessary evidence, Garrus will head off to find Count Andel Indarys and afterwards he will meet the player back at the Cheydinhal Bridge Inn. After this, he will resume his usual schedule. Corruption and Conscience: The Captain of the Guard in Cheydinhal is corrupt and the citizens want him removed. Esta página foi modificada pela última vez à(s) 09h47min de 22 de dezembro de 2012.